Today has been a strange day. For weeks I have been waiting for some overcast. I have a list of sites that I want to photograph but I would need even lighting, which an overcast day would provide. 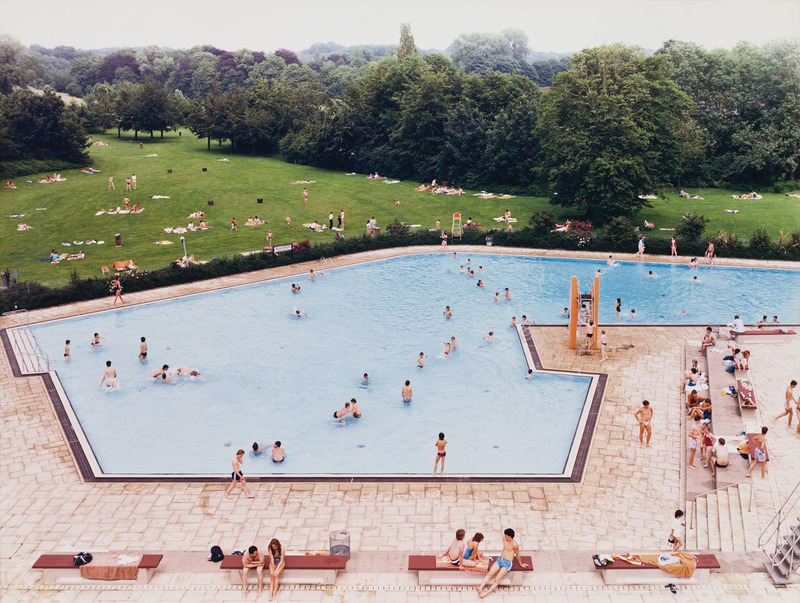 It is easy to do this in Germany and there is no surprise that Gursky’s, Bernd and Hilla Becher’s, Elger Esser’s, Thomas Struth’s early images illustrate this cold, neutral, clean aesthetic, that is characteristic for that area. Düsseldorf and the region around has less sunlight than most other areas in Germany. Perfect for someone who likes to shoot on overcast, shadow-free days. 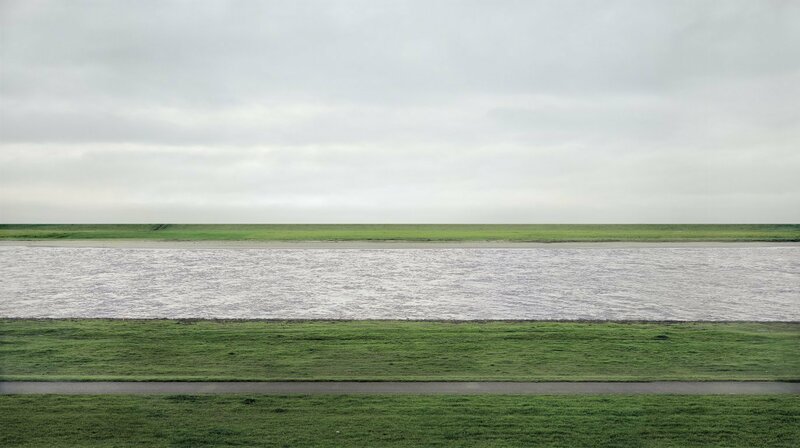 Here is one of Gursky’s early images. Warm day, overcast day. He took this in Ratingen at one of our public pools. Many of his early photographs where taken around the town where I grew up. Most of them shot on overcast days. My favorite is still “Rhein II”, which portraits this river as what it is. No romantic view, no sunset, no people, just a straight stream. Whenever I see this image I think of the view on the Rhine from my grandmother’s house. Some people may say that there is not much in this photo. No action, no dramatic light, no people doing anything unusual. True, but that’s how the river looks like 90% of the time. How tempting to wait for a person on a bike to ride along the rim. Gursky avoided that temptation to follow an ‘established aesthetic’. It is very a minimalistic but grand portrait of a river and that is why I like it. Gursky grew up one town away and Gursky’s father, and our landlord (both from in Leipzig, one became a photographer and the other an architect) would hang out downstairs in the backyard. My mother later told me that Andreas Gursky would sometimes come along and our landlord had told her that the son would do something around photography. That was in the late 80s, early 90s before he had his big success. OK, enough sentimentalism and missed opportunities. So I have been waiting for a few overcast days without any luck. Boston has 2,5 times more hours of sunshine per year than Düsseldorf. At some point I realized that I have to work with what I have. If I have sun, then I have to find a way to work with it. This morning I looked through my book shelf and pulled out an old-time classic. 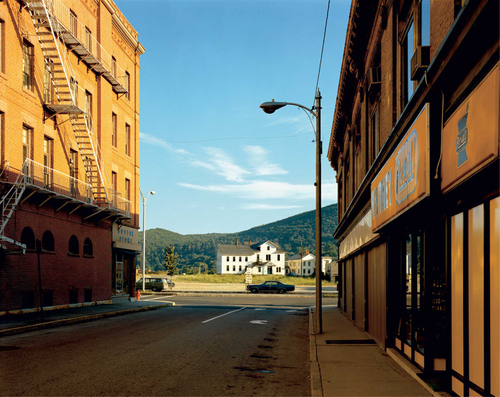 Stephen Shore’s Uncommon Places. There I had it: while almost 4o years old, it provided a fresh look at someone who used full sunlight and still managed the contrast and tones. What is nice about Stephen Shores book is that he often provided street names and town names. I spent some time this morning using Google Streetview to find the places again and to see how they have changed during the last 40 years. This here is Holden Street in North Adams . Type in 10 Holden street, North Adams, MA into Google and click on the Streetview image. The two buildings are still there. 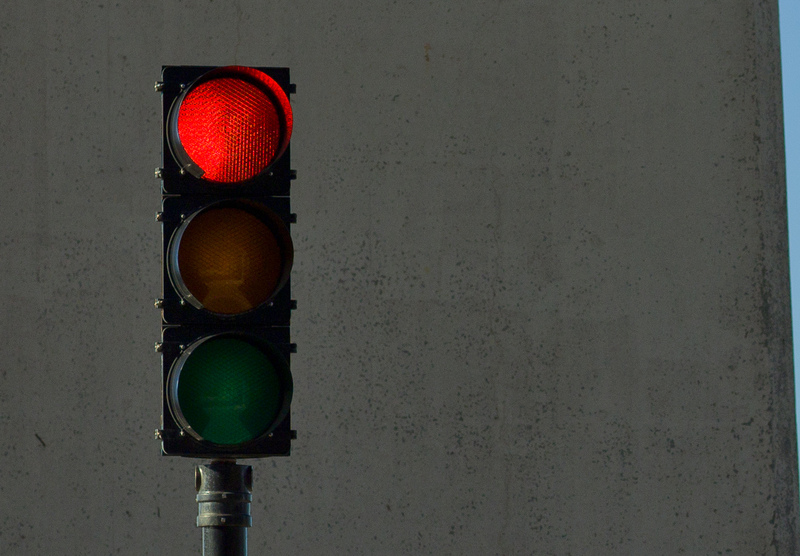 The green is not. It got enriched by a Radio Shack. 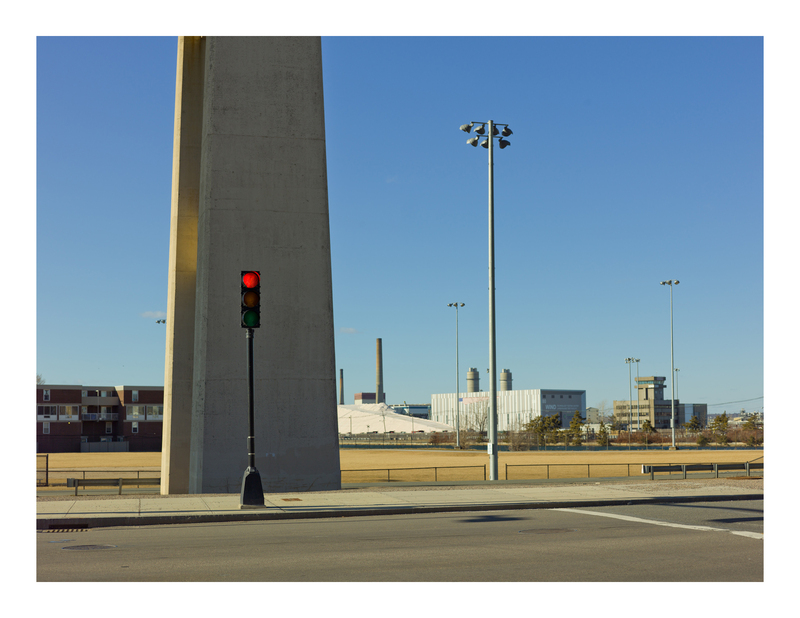 I grabbed my equipment and took off to explore Boston through a different lens. My initial plan was to drive up to Revere and Wonderland. The cold, really cold breeze made me change my plans and I stopped at Charlestown right underneath Tobin bridge. From there I walked around the Navy Yard. When I went back to my car I saw this simple arrangement of verticals with this bright red light in it. The sun was low and coming from the side, still the image felt evenly lit. I took two shots. While I see a lot in this shot, others may not. It took 10 seconds before a police card stopped. The officer jumped out of the car and asked me what I was doing. Taking photos of the bridge I said. That’s not allowed, I can’t take images of the bridge, he said while he showed me with his hand that he wanted to see my ID. I asked him if he is certain that I would not be allowed to take a photo of that structure. At least I knew that I was in a public place taking a shot of a public piece of architecture. Actually just of a tiny bit of its lower column. I think that was one question too many. For ten minutes he left me standing there in the cold at 25 Fahrenheit with strong wind right into my face, while he was doing a background check from his cozy SUV. When he handed me back my ID I asked him again politely. That time his story had changed. Now I was allowed to take any photo, but, so he said, because I was away from the tourist site, surrounded by housing projects, taking a photo of bridge was very suspicious, especially when there is nothing worth photographing. He did not see anything interesting in this scene. Maybe most of the readers won’t see anything interesting in this photo. I really like it so there must be something there, at least for me. I assume that as long as I take photographs of objects and scenes that the law enforcement would rate as photo worthy, I would not be identified as a suspicious person. That’s why taking a photo of the Golden Gate Bridge is fine, but taking one in a remote location of the not so pretty Tobin Bridge is not. Lesson learned. I think it is good that the police keeps an eye open and I have been checked several times and got used to it. It is ok as long as they know that I am doing something suspicious, versus doing something illegal. I still remember being surrounded by three police cars in late 1999 with officers pointing guns at me while I was taking a photo. That’s another story. PS: Got nice detail in that shot despite that I had to hold the camera while standing in the blowing wind. hallo dirk, deine mutter schickte mir deinen bericht und ich bin angetan, wunderbarer artikel und herrliche fotos. möchte dich direkt begleiten bei deinen sicht-entdeckungen. irgendwie warte ich auf ein buch vom frisen dirk, in dem all die bilder und short-stories enthalten sind…like a fotobook……may be?????? ?